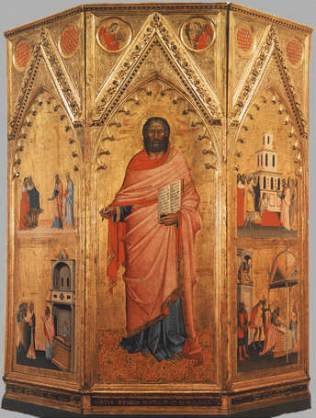 St Matthew Triptych and Stories from his Life is a work of art by Andrea di Cione, also known as the Orcagna, completed by his brother Jacopo di Cione and dating back to c. 1367-1368. It testifies the importance of the Florentine Guilds, the “Arti” (corporation of workers) in the history of Florence. The Guilds were extremely important for Florence, not only economically (they actually produced the wealth of the city), but also culturally because they took care of various monuments and also commissioned many works of art. This rather unusual work of art is a clear example of these commissions. Just look at it: its shape is weird, but its weirdness will soon disappear if you consider its original destination. The Triptych was in fact commissioned by the Bankers Guild and was meant to be a "clothing" for the west pillar in Orsanmichele Church, the Florentine Guilds Church.